The post-San Francisco Seals history of Ewing Field. 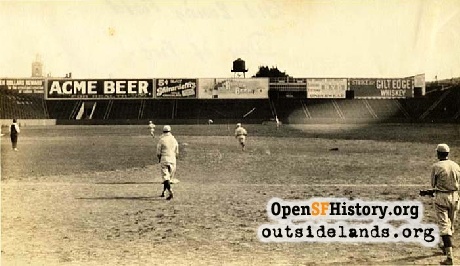 Read about Ewing Field's 1914 start as the home of the San Francisco Seals for one challenging season. After a brief respite following the last baseball game of 1914 at Ewing Field, 4,000 spectators converged at the re-purposed facility on February 14, 1915 to see…a baseball game. A contingent of Pacific Coast Leaguers and a squad of major leaguers held a benefit game for an injured ball player. On that same day the final soccer match was played at what had become the city’s main soccer venue: Recreation Park in the Mission District, the new/old home of the San Francisco Seals. 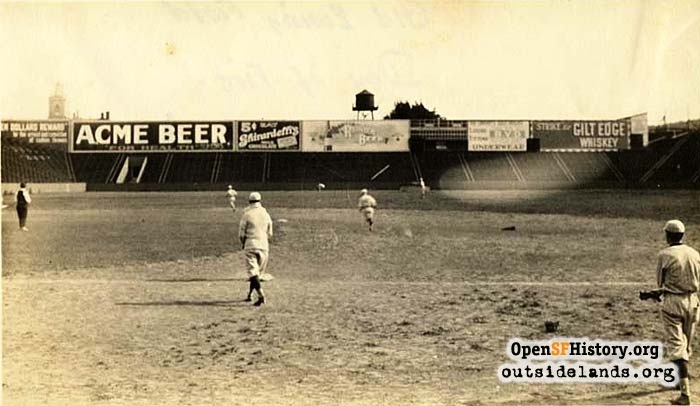 Several other baseball games filled out the month of February at the old ball yard before soccer claimed Ewing’s turf. On November 6, 1915, the archdiocese released Cal Ewing from his twenty-year lease. The field he built, however, would bear his name for the next twenty-three years. On November 13, 1915, 12,000 fans packed Ewing Field for the “Big Game.” Truthfully, this was not the real Big Game—the annual football face-off between traditional rivals, University of California, Berkeley, and Stanford University—but rather a rugby match between Stanford and Santa Clara University. In 1906, a nationwide campaign against the dangers of “American” football had resulted in most of the high schools and colleges switching to rugby, including Cal and Stanford. After the 1914 Big Game, Cal returned to American football while Stanford continued to embrace rugby. Thus, in 1915, the two rivals were unable to battle each other. Stanford and Santa Clara University appropriated “Big Game” for their 1915 rugby match, with Stanford winning 30-0. The two schools would play Big Games through 1918. With spring’s arrival, soccer returned to Ewing Field, along with a brief high school baseball season. Then came the Aida fiasco. On September 30, 1916, Ewing Field was to be the setting of an outdoor performance of Verdi’s grand opera. Weeks of preparation and rehearsals with a cast of hundreds of singers, dancers, musicians, and supernumeraries on a stage larger than the infield were for naught. Twenty thousand tickets had been sold, but the performance was rained out. The unimaginable happened in 1917: the Seals returned to Ewing Field. At the conclusion of the 1916 season, Recreation Park underwent demolition and expansion, but work was not completed in time for a three-game preseason series against the Chicago Cubs. Basking in sunshine, the Seals staged a triumphant return to their old grounds on March 16 with a 3-2 victory before a huge crowd. The Seals took two of three games from the Windy City nine before bidding adieu once again and forevermore to Ewing Field. San Francisco high schools resumed American football in 1921, becoming consistent and dependable crowd-pleasers. After the six-month Pacific Coast League season ended, football, particularly high school football, was the only game in town, and Ewing Field was the main venue. The big attraction was the annual “High School Big Game” between long-time rivals Polytechnic and Lowell. The early-to-mid 1920s was unquestionably Ewing Field’s heyday. 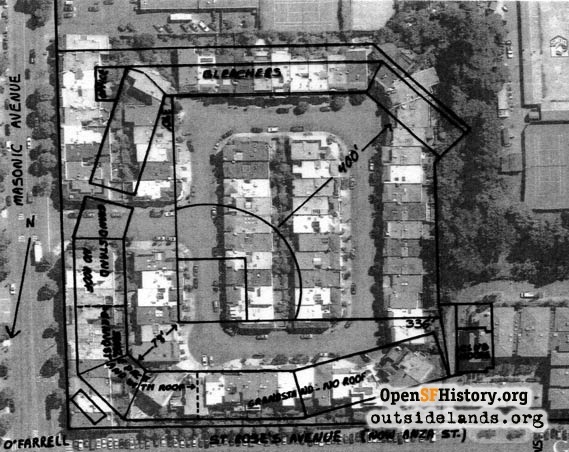 A debacle as a baseball stadium, it found its niche as the city’s pigskin palace, where some of the largest sporting crowds in San Francisco history congregated. On October 16, 1921, the football powers of Stanford University and the Olympic Club entertained 5,000 spectators at Ewing. The Poly-Lowell High School Big Game drew 10,000 a month later. In 1922, neither Poly nor Lowell were contenders for the city championship, yet 7,000 football fanatics endured a downpour on November 11 to watch the two teams wallow in Ewing Field’s mud to a scoreless tie. In 1923, St. Mary’s College and Santa Clara University leased Ewing Field and invested $15,000 to expand its capacity to 26,000. The first football cleats to chew up the new turf belonged to the Poly and Commerce teams on October 3, 1923, as 4,000 saw the Poly Parrots soar to a 33-0 triumph. A month later the High School Big Game drew 13,000 witnesses to another Parrot victory. On November 10, 1923, St. Mary’s and Santa Clara played the first of what would become an annual tradition between the two schools: “the Little Big Game.” Santa Clara squeaked by 10-9 before a crowd of 12,000. The next day, more than 15,000 high school gridiron enthusiasts packed Ewing Field as Poly defeated Lick-Wilmerding to capture the city football championship. Poly and Lowell didn’t face each other in 1924, so, hungry for knock-’em, rock-’em, sock-’em football, 23,000 collegiate fans squeezed into Ewing Field for the Little Big Game on Thanksgiving Day. As far back as 1912, the city had proposed building a publicly-owned athletic facility at the southeast corner of Golden Gate Park, across the street from Polytechnic High School. Nothing happened until 1921, when the Poly student body, led by its president, James Rolph III, son of San Francisco mayor “Sunny Jim” Rolph, got the city moving on a new stadium. Work began in 1924, and Kezar Stadium opened in May 1925. This city-owned field could accommodate 22,000 fans, but Ewing Field remained an important athletic resource. The 1925 schedule of high school football games was evenly distributed between Ewing and Kezar. 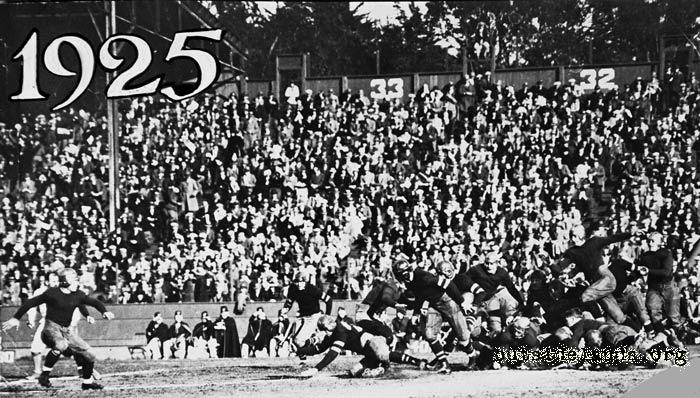 That year’s High School Big Game at Kezar attracted 15,000 rooters, the same as the Little Big Game at Ewing. On December 26, 1925, Ewing Field received national attention for something other than weather-related ridicule: the first East-West Shrine College All Star Game. The Chronicle gushed, “Never before have there been so many stars of national reputation in one competition.” The West won 7-0 before 20,000 on a touchdown by Cal’s Brick Muller. Ewing Field on June 5, 1926. Fire in the stands that day destroyed the bleachers and nearby homes., Jun 5, 2019 - Courtesy of Presentation Archives, Sisters of the Presentation, San Francisco. In addition to team sports, Ewing Field was the occasional setting for boxing matches. Originally these bouts were a small part of a larger sports spectacle, but boxing promoters spent $15,000 to adapt the field for a world’s welterweight championship bout on May 16, 1925. Ten thousand people paid up to six dollars for a ringside seat. After four preliminary bouts, the main event lasted ninety seconds as the champ, Mickey Walker, KO’d Lefty Cooper. On June 5, 1926, a fire destroyed the original baseball grandstand along the field’s north and east sides. The 21-alarm blaze consumed dozens of neighboring homes, causing more than $300,000 in damage. The field was insured, and on July 7, 1926, its gates opened for a boxing match that drew 7,000 aficionados of the pugilistic science. Reporting on the match, the Chronicle observed “There is little to make you remember that Ewing Field was the scene of a disastrous fire several weeks back. New fences have been raised where there was nothing but a burned section and temporary grandstand and bleacher seating has been provided.” The gutted grandstands weren’t rebuilt, reducing Ewing Field’s capacity from 26,000 to 12,000. The second East-West Shrine game was held at Kezar Stadium, but Ewing Field still had a lot to offer. Mervin Cowen, an astute sports promoter, reasoned that if the public would pay good money to watch amateur high school and college football, it should be willing to pay great money to watch professional football. The fledgling National Football League was attracting paying spectators back East, so why not have professional football on the West Coast? The four-team professional Pacific Football League was formed with teams in San Francisco, Oakland, Los Angeles, and Hollywood. Ewing Field was the home of the San Francisco Tigers. 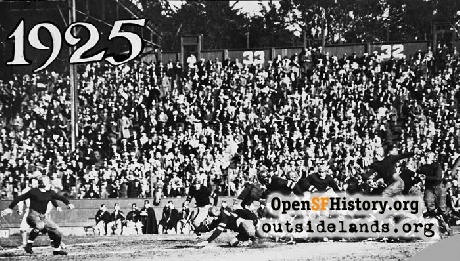 On November 14, 1926, 3,000 people beheld the first professional football game in San Francisco history: a 3-0 loss to the Oakland Oaks. The league folded a month later, but Cowen saw another moneymaking opportunity in having an all-star team of West Coast professionals battle barnstorming Eastern professionals at Ewing Field. On December 18, 1926, Ernie Nevers, Stanford’s former All-American fullback, and his Duluth Eskimos defeated the California All Stars of the Pacific Football League, 19-0. On January 10, 1927, the local pros shut out the NFLers 19-0, with Brick Muller, hero of the first East-West game played at Ewing Field a year before, as the star. Another pro game was played before a packed house of 12,000 two weeks later. In the last game of the season, Red Grange (“The Galloping Ghost”) and his New York Yankees played an all-star team of former college players. Brick Muller, alongside Stanford’s Ernie Nevers, and another former Cal star, Tut Imlay, bested the pros 7-6 in front of 7,000. Following the conclusion of the 1927 eastern professional football season, Cowen enticed four groups of barnstorming pros to California. It was Cowen’s intent to have a winter West Coast Professional Football League made up of these four teams that would play one another in San Francisco and Los Angeles over the course of six weekends in January and February. Ewing Field would be the site of the San Francisco contests. The first game, on January 2, 1928, pitted Red Grange’s New York Yankees against George Wilson’s Wildcats. About 5,000 watched the two elevens slip and slide in the Ewing Field slop to a 6-0 Wildcat victory. Perfect weather the next week brought more than 7,000 who saw Ernie Nevers’ team fall 13-6 to Benny Friedman’s Bulldogs. By the third week, the novelty had worn off. Just 2,000 paid to watch the unbeaten Bulldogs hand the Wildcats their first loss 12-6. The end of the professional experiment was a 13-13 tie between Nevers’ and Grange’s teams before the smallest crowd of the season. 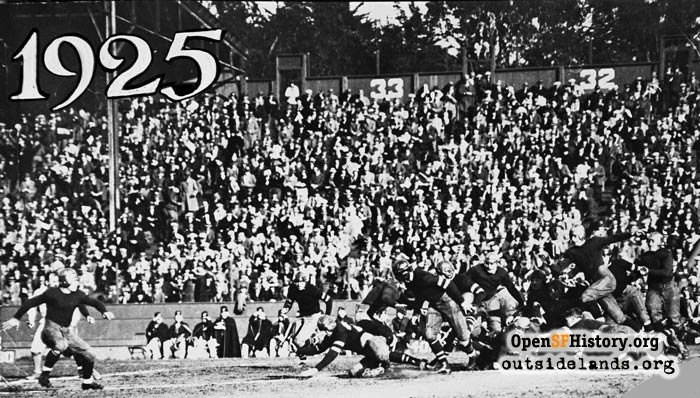 In the meantime, high school football simply outgrew Ewing Field as evidenced by the 30,000 who jammed into the 22,000-seat capacity Kezar Stadium for the 1927 Poly-Lowell Big Game. In early 1928, work commenced to expand Kezar to 60,000 seats. The job was completed in time to welcome the 50,000 who saw the Poly-Lowell Big Game on November 29, 1928. By 1931, the transition to Kezar was complete. There were no more high school games or large crowds at Ewing Field: just weekend warriors playing before modest turnouts of faithful friends and family. Perhaps the most noteworthy event of the stadium’s later years was in 1932, when Frankenstein defeated the Barbarians at the foot of Lone Mountain. Actually it was the Hollywood Cricket Club, which included Boris Karloff (who had portrayed the monster in the recently-released movie) versus the San Francisco Barbarian Cricket Club in a cricket match. On January 19, 1937, Cal Ewing died at 69 years of age. Ewing Field outlasted its namesake by seventeen months. The Heyman Brothers Construction Company bought the land from the archdiocese in June 1938 for $150,000, and demolition began on Halloween. On July 29, 1939, the first houses in “Ewing Terrace” were advertised for $7,950 and up. One of the amenities of the new houses was a glass-enclosed interior patio that would allow sunshine, light, and warmth directly into the home. Twenty years later, a new stadium was under construction—Candlestick Park. Over fifty-four years, tens of millions of fans attended events at Candlestick, but it became known as the stadium that everybody loved to hate because of the same weather conditions people complained about at Ewing Field: wind, cold, and fog. On Candlestick Park’s opening day, April 12, 1960, at least two spectators in attendance had been at Ewing Field’s inaugural in 1914. And once again they didn’t pay. San Francisco Examiner sports scribe Prescott “Scotty” Sullivan sat high above the field in the press box while Governor Edmund G. “Pat” Brown shared the field-level VIP box with Mayor George Christopher, baseball Hall-of-Famer Ty Cobb, and Richard Nixon. Did Scotty and Pat, boyhood best friends, meet and recall sneaking under the fence at Ewing Field’s opening day? Surely, during Candlestick’s early years there were enough other old timers still around to recall the days of 1914 and compare them, for better or for worse, with the 1960s. What might they have said?